Heat the olive oil in a saucepan and then sweat the onion with a pinch of salt until soft. Add the garlic, cook for 1 minute and then add the pumpkin and the thyme. Cook for a further 5 minutes until the pumpkin begins to soften and then cover with the milk and water. 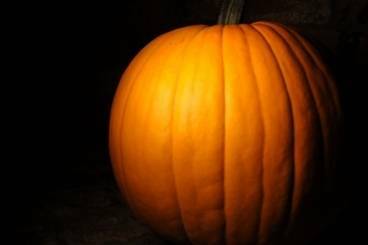 Cook for 30 minutes or until the pumpkin is completely soft. Transfer to a food processor and blend to a puree. Add salt and pepper to taste. If the soup is too thick at this point, add a little more milk. Keep warm until ready to serve. Mix the pumpkin seeds with the olive oil, salt and dried chilli flakes. Lay on a baking sheet and then cook in the oven for 5 minutes. Serve the soup in a bowl with a sprinkle of spicy pumpkin seeds and a drizzle of olive oil.